Last week, the 1st international SOFA Week took place in Strasbourg (France) and already appears to be a great success within the community. Open and free, this SOFA Week 2018 was designed to gather the entire SOFA community, to present technological and scientific advances, while fostering the networking within the community. How to better interest new users than with a training session? The SOFA Week 2018 started with a training day involving 9 participants coming from 6 different countries. 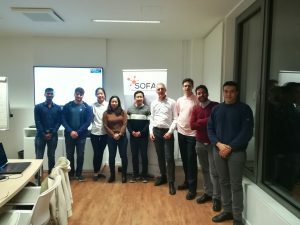 Such training sessions are regularly organized in order to introduce new users to SOFA, provide the theoretical backgrounds on physics simulation and to work on both user and developer tutorials. In case you are interested in a training, do not hesitate to write us. Regarding your interest, new on-line and on-site sessions (Paris) will soon be announced. 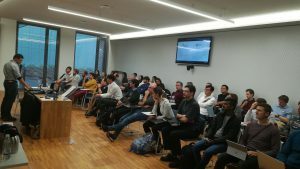 Many researchers and companies from the community expected an event to share ideas, experiences and to present their on-going research or products based on SOFA. 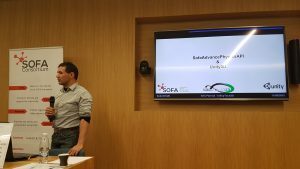 With five different sessions, a total of 23 oral presentations and booths for live demonstrations, the SOFA International Symposium met all these expectations. 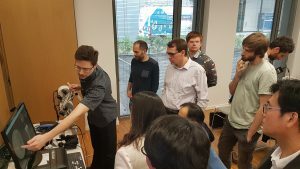 More than 55 international participants from 10 different countries took part to the Symposium event on-site and a live stream allowed more than 20 attendees to follow the different sessions. We are excited to see the resulting collaborations to come! All photos are available online. 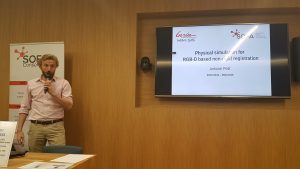 For the first time in SOFA history, researchers from the community provided an advanced introduction to specific plugins: AdaptiveBeam plugin, Model Order Reduction plugin and the SoftRobot plugin. The organizers presented their plugins and explained the scientific associated backgrounds. With such an insight in these plugins, the plugin session strongly motivated collaborations and new project ideas among the 40 participants. We hope to see more of these plugin sessions in the future! The week ended with the bi-annual SOFA Technical Committee #6. This technical committee governs and takes all technical decisions for the roadmap towards upcoming releases. Open and free, the STC is the occasion for all SOFA developers to meet and discuss the on-going and future developments in SOFA. As a consequence, it is also a unique opportunity to get closer from the dev community and code all together during the coding sprint session. A summary of the STC#6 will soon be made available online. the 23 spaekers for their venue and the quality of their presentations, the success of the SOFA Symposium relied on them! Let’s organize this again in 2019!